Thunder rumbled somewhere to the south as I hiked through the drizzle and drip of the Blue Well Trail, under its sheltering but soggy canopy of lush green limbs. I’m so addicted to my Broad Meadow Brook Audubon hike that I ignore the ominous echoes of the story; I tell myself that while lightning might strike a tree any moment, at least here a stray bolt would have so many trees to choose from. Much better than hiking, say, through the open field the power lines that run adjacent to this trail. I suspect this logic is profoundly flawed, but any rationale that propels me through the natural world – pushing my bodily limits, feeling my breath rise and fall, the blood pound through my heart – helps me connect to both my own physical existence and to my place in the broader scheme of creation. I pay attention to the rain-slicked roots and rocks, but I keep pushing forward, if only to keep my heart rate up. And since one sure way of keeping one’s heart rate up is to tap into the fear of electrocution, I eventually do up the ante, cross back onto Power Line Trail. I don’t know who Barbara Walker is, but I imagine this “quiet advocate” had more sense than to cavort beneath power lines in a thunderstorm. I also imagine her as someone who sees, hears and even smells what I do not, who would take in what I see before me with an observational skill and depth of understanding that would make me seem dear and blind by comparison. I wonder about her every time I pass the bench, but somehow have come away knowing even less about her as I do about butterflies, which is saying something. 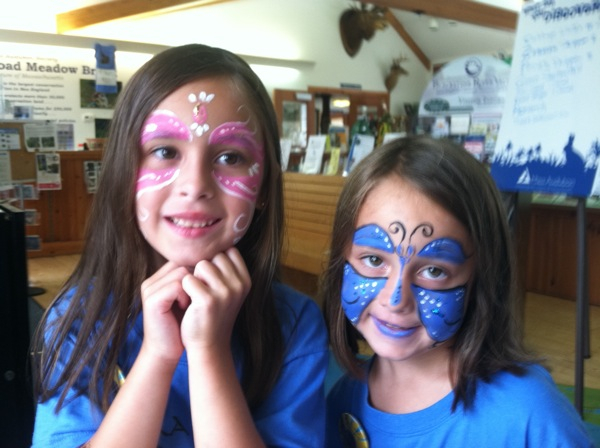 This, however, is my day to remedy at least some of my ignorance – for back at the Visitor Center, Broad Meadow Brook Audubon is defying the weather itself, holding its fifth annual Barbara J. Walker Butterfly Festival. So after I slosh my way through the remaining hour of my hike, I pantingly climb up the lawn – past the butterfly face-painting and numerous other booths – and ask someone at to the counter if there was a friend of Barbara around. Within five minutes I’m hunkered down with Rick Walker, who met Barbara Martel when “I was 13 and she was 11 –seven years later, we were married.” They would stay married for 39 years, until cancer claimed her life on March 29, 2008. She was only in the hospital for a few days, and practically right up until the end, her life was immersed in both enjoying and advocating for nature: The couple had just done nature-related trips to Amelia Island in Florida and out to New Mexico, observing birds and butterflies; at the time of her death, she was helping create the festival that, unknown to her, would come to bear her name. Within a few months, Rick and others had built the bench out of recycled wood, placing it in Barbara’s favorite observation spot. I tell Rick while I love the bench, I can’t sit still that long. Of course, one doesn’t get a bench, let alone a meadow, named for you just because you enjoy the place. Walker ultimately got involved in protecting the places she loved, and she had an ideal skill set for the work. “It didn’t hurt that she was a microbiologist,” said Rick, who proudly told of the 12 publications she contributed to as a lab technician for the University of Massachusetts Medical School. He described how she – often with his help – would collect specimens to measure the health of Troiano Brook and the marsh where the water flowed into the sanctuary; during the hours of down time between the start and the conclusion of a lab experiment, she would go to the sanctuary and find out what she could. “As goes the brook, so goes the rest of the sanctuary,” Rick said. 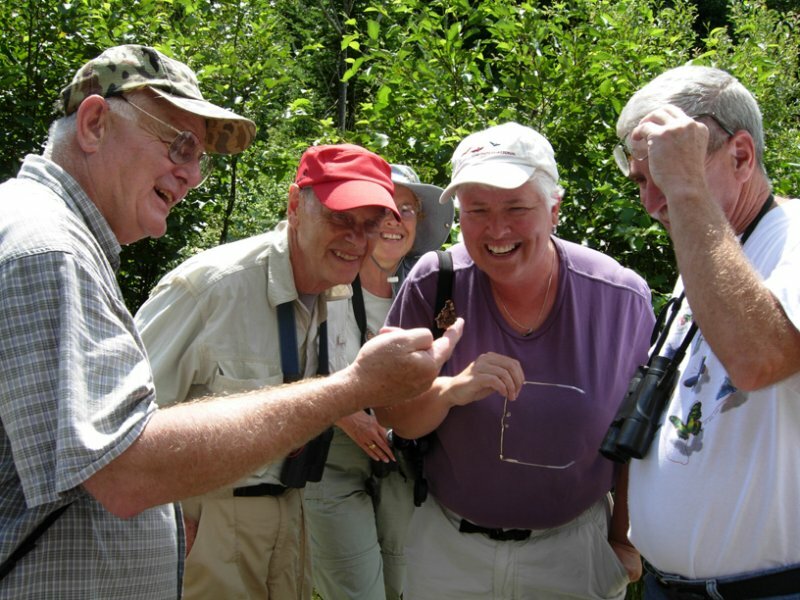 Barbara Walker also was involved in the six months of research that went into the decision to cut away the woody plants under the power lines, mowing down the vegetation to two inches high; the choice upset birders who enjoyed warblers and other birds who nested there, but was better in the long run for butterfly habitats to flourish. For this and other reasons, when I mentioned the sign calling her a “quiet advocate,” her husband had to laugh. He indicated that son Michael and daughter Kerry would set me straight on that score. 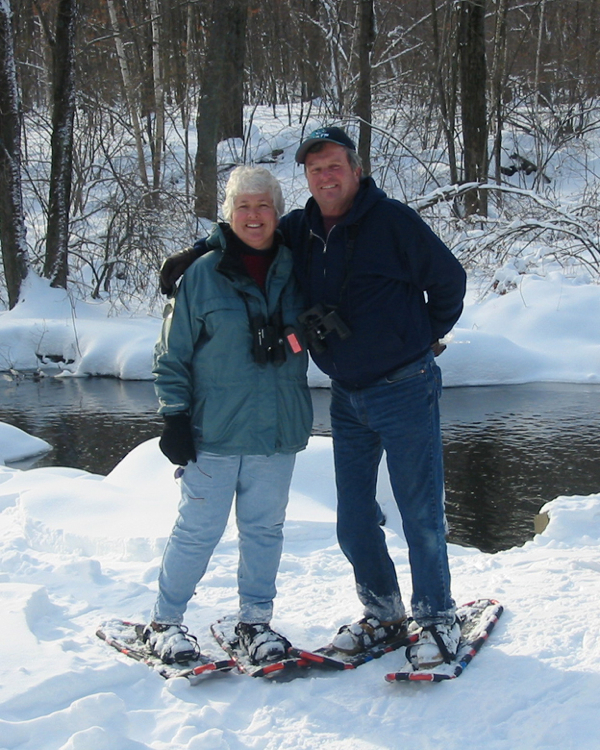 Meanwhile, Rick and Barbara’s children would develop their own passion for both volunteerism and the outdoors. Mike Walker’s blog Northern Harrier – at Blogspot.com – provides years’ worth of images and words bearing testimony to the natural world and his family’s engagement with it. 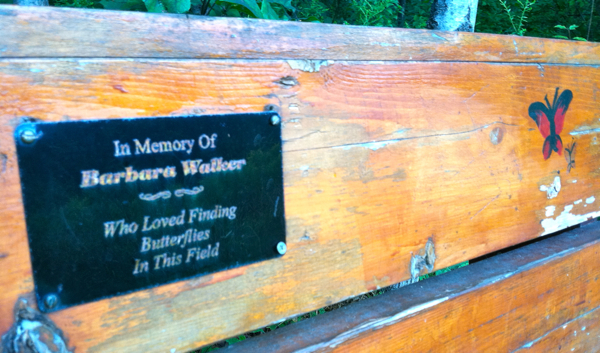 Listening to our conversation, friend Elise Barry, also a butterfly enthusiast, remembered something else about Barbara. Some of us are drawn to forms of service devoted more directly to problems humans face beyond the woods and fields – challenges such as poverty, addiction, discrimination, and violence. But losing our problems and prejudices in the natural world can provide both spiritual and physical health for those caught up in the gears of manmade calamities – and grant us the wisdom and generosity to create a more compassionate world. the Cape Cod Museum of Natural History – Barbara Walker liked it so much, she asked her son to photograph it. 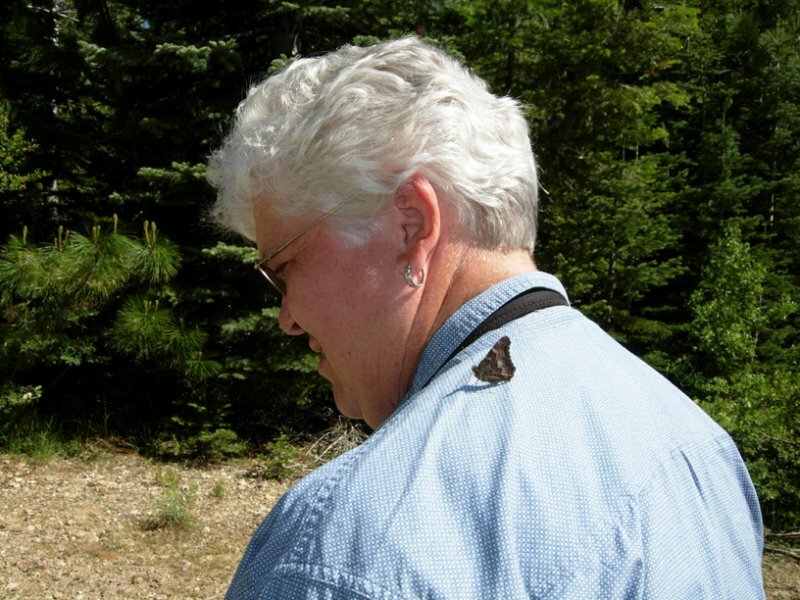 In the passage, Carson is reflecting on how her and fellow observers felt after observing Monarch butterflies on their journey – and the lack of sadness knowing there would be no return. “But it occurred to me this afternoon, remembering, that it had been a happy spectacle, that we had felt no sadness when we spoke of the fact that there would be no return. And rightly-for when any living thing has come to the end of its life cycle we accept that end as natural. For the Monarch, that cycle is measured in a known span of months. And I have, indeed, found my measure of deep happiness at Broadmeadow Brook – thanks to the Barbara Walkers of the world. A wonderful and engaging story, and a lovely tribute to Barbara!